Jericho makes his way to the ring for the opening match. He’s pumped for his rematch with AJ Styles. After getting punched in the face, Jericho respects AJ, but he doesn’t like him. He says AJ is not phenomenal, at least not compared to him. He reminds everyone of the ladder match he had with Shawn Michaels in Portland. AJ makes his way to the ring. Before the ref can ring the bell to start the match, the Social Outcasts interrupt. They say they are the phenomenal three (Bo Rida is still in the studio recording). Adam Rose says the headlining act tonight will be the Crimson Werewolf and the Social Housecats. Curtis Axel wants use the name “Axel Rose.” Rose thinks that’s dumb because Guns ‘n Roses is back on the road. Slater then welcomes Jericho and Styles to the jungle. Jericho is annoyed. He hits Slater with the mic. 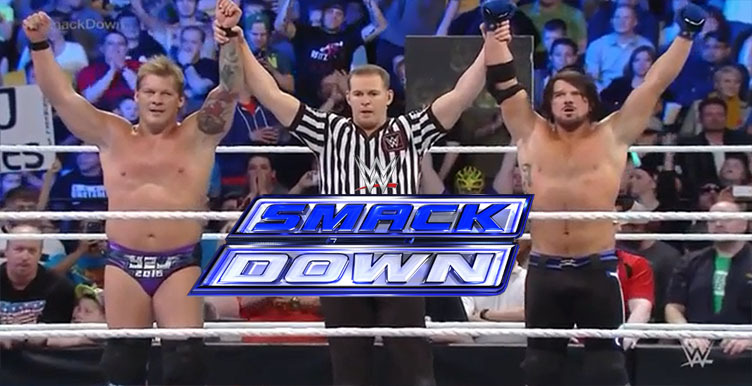 Jericho and Styles remove the Outcasts from the ring, then Jericho says they’re all going to fight. Pretty good match. It was really an excuse for extra buildup in the Styles/Jericho feud. They started trying to outdo each other while beating up Curtis Axel. As they argued Adam Rose took control and swung the match in the Outcasts’ favor. Even so, they were really just props in this match. When the smart way they’ve been wrestling lately it felt like a bad night for them. But this match will probably have implications in the one-on-one match later on. Styles got beat up more than Jericho. After the match, Jericho gives Styles a Code Breaker. RAW Rebound featuring Reigns, Ambrose, and Lesnar. The Dudley Boyz head to the ring. Bubba is sick of hearing about Daniel Bryan. He’s actually sick and tired about a lot of things. D-Von reminds everyone that they are not a nostalgia act, they are the baddest team on the planet. Bubba says they came back to WWE to add to their legacy. He calls for the ring crew to get rid of all the tables surrounding the ring. He says it’s the last time they’ll see tables. People shouldn’t chant for tables, they should chant for the Dudley Boyz. They take the last table, fold it up, and carry it away. Very good match. There were a couple of slightly awkward moments, but the good far outweighed the bad here. Naomi looked very good. It was like she was making a statement that she shouldn’t be left out of the conversation when it comes to the top women in the company. Sasha Banks also looked very good in the match. There were some nice sequences in the match such as trading pinning attempts early on. The match as a whole was very competitive. Towards the end there was a similar incident to what happened on RAW, only the rolls were switched and Sasha helped Becky. Becky, though, wasn’t all that great on commentary. She should stay away from puns (yeah, I know her catch phrase is a pun). This feud is so much more interesting and entertaining than anything involving Charlotte over the last few months. There have been consistently good matches and interesting character interactions. Some of the story is a little predictable, but I think everyone involved, including Naomi and Tamina, are making it interesting. As the Wyatt Family heads to the ring, we are shown a video showing clips of the destruction that they’ve caused. Bray Wyatt talks about the battle of the titans, the old gods versus the new. Bray is now the king of the gods and the Family is his army. The Family has its sights set on ridding the WWE of its titans. Luke Harper says that in the presence of the Wyatt Family, even the largest titans turn into mere mortals. Erick Rowan says there is no point in resisting. Braun Strowman says the earth will shake and oceans will boil. Darkness will consume all. Bray says the apocalypse is all around. He is the angel of the dirt, the eater of worlds. He is Bray Wyatt. The war against the gods has only just begun. WWE celebrates Black History Month with pictures of African American wrestlers. This was a fun, quick match. The team of Neville and Lucha Dragons was all over the place and completely destroyed Konnor. I would have liked for Stardust to have gotten into it with Kalisto a bit so they could plant a seed for a possible US title feud (that is, if Kalisto retains at Fastlane). Another very good match. This one was a little more competitive and heated which is natural considering the progression in their rivalry. Of course, Styles had taken more of a beating earlier in the night, so it still leaves questions about who is better. I think they’re handling AJ’s debut very well. Despite only having four matches (or maybe because of it) this was a very good show. The main event and the women’s match were both very, very good. I also thought the Dudley’s segment was quite good, and the Wyatt Family segment was intriguing. I really wanted the Banks versus Naomi match to be the match of the night, and it probably would have been on any other Smackdown, but jericho and Styles will probably steal any show they are on. I like a feud where two people just want to find out who is better. And both of these guys are great.